If there’s one thing that scares the human soul it’s uncertainty. Regardless of how much knowledge we have of the inevitable, no matter how many plans we make and how much we try to work on them, there’s always that doubt. There’s always going to be that uncertainty of how things will go, where our lives are headed etc. Today was a good day, went out with the siblings, chilled, played bowling, Batool enjoyed it too. There are a couple of things running in my mind at the time, I am loving this break from life I am getting in Dubai. And as much as I am ready to face the challenges of a single mother, there’s always that doubt, that need to want to know the future, to know that all is going to be fine. At these times I remind myself to strengthen my faith in God. I couldn’t help but share it, looked for the whole chapter and read the translation. And wow! am I relieved! There’s nothing like an open conversation with your Creator. And this just lifted up my spirits. It is always good to know that your God has not and never will forsake you. As human beings we are constantly reminded of our dependency on others, and it can take a toll on the strongest of us. And as a mother I feel the need to always be strong for Batool, and constantly give out positive energy, be the best role model of faith, determination, hard-work and clarity. 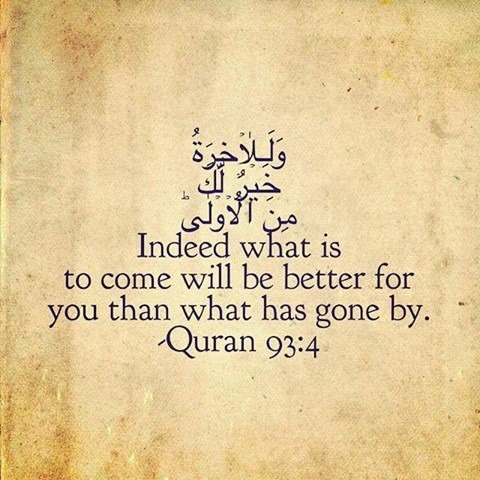 Life isn’t easy, but it’s good to know that there’s someone always watching you, and that verily the future will have better in store so long as the intentions are clean. That’s really hopeful. It is the best feeling in the world to know, that you are never really alone and that God is always with you.